A proposed deal between Likud and Hatnua would give Tzipi Livni sole oversight of Israel’s talks with the Palestinian Authority. Prime Minister Binyamin Netanyahu has made headway in his attempts to form a coalition, having apparently convinced Hatnua head Tzipi Livni – his former political rival as head of the Opposition – to join the government. The two will hold a joint press conference at 8 p.m. at which they will reveal details of their agreement. 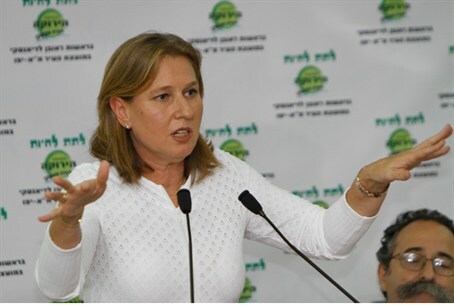 According to initial reports, Livni will be made Justice Minister in the next government. In addition, she will play a major role in diplomatic talks with the Palestinian Authority. Livni will reportedly be the only minister authorized to negotiate with the PA, and will report directly to Netanyahu. The six-seat Hatnua party is expected to get two other positions as well: MK Amir Peretz will be made the Minister for Environmental Protection, and MK Amram Mitzna will head the Knesset’s House Committee. The surprise announcement regarding the agreement with Hatnua comes one day after Bayit Yehudi (Jewish Home) head Naftali Bennett reported that there have been no serious coalition talks between Likud and Bayit Yehudi for a week.